So once again, I’ve listened to all you silly gooses and abandoned my recipe for a chive and green onion potato strata in order to give you something simple that really highlights the Klondike Rose Potato. This is, after all the last week of the month-long giveaway and your last chance to win, Win, WIN! Now, some of you may be whining – “But I want a potato strata!” Ok, ok. I hear you, too and I will give you one next week. If you’ve kept up with your blog reading, then you know that Klondike Brands and I have partnered together to give away 4 prize packs full of Klondike Potato Goodies, including a cookbook, cooking items and more! Each Monday for the past three weeks I have been hosting a weekly giveaway for 1 of these prize packs and today is the fourth and final week to WIN. This contest starts on Monday September 30th and ends the following Sunday night at midnight. Winners will be announced on the following Monday’s post and notified by email. So who is last week’s winner? Congratulations to TAMERA JO ABEL CLARK! If you haven’t won yet then now is the time to get those entries in, folks! It’s easy to enter; just follow the widget below. You get 1 entry for leaving a blog comment and up to 5 bonus entries. You can also get a sweet coupon from Klondike Brands HERE. I love French fries and I love any recipe where you can use French words in place of English ones. Isn’t “frites” such a fun word to say? I like the way the ‘f’ and ‘r’ bounce off the tongue and the ‘ts’ abruptly ends the word. Just make sure you say it like ‘freets’ and not ‘frights’ so you sound like you know what you’re talking about, even if you don’t. 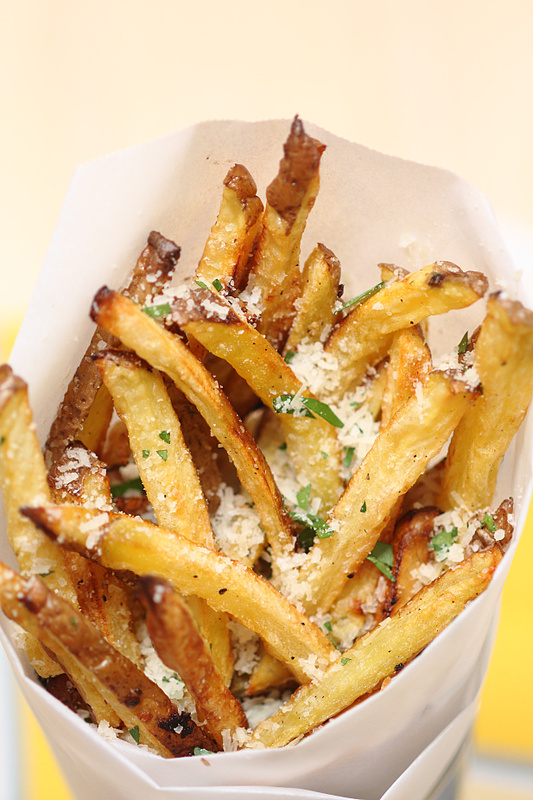 These particular frites are seasoned with garlic, parmesan and parsley. Do I need to give you other reasons to make these? I didn’t think so. They are not technically fries because they are baked but if you follow my crispy potato tricks, I guarantee you will not even notice once you munch down on the cheesy, potato-y goodness. There are a few tricks to getting crispy potatoes in the oven. 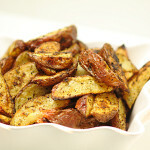 If you’ve seen my post for Crispy Herb Roasted Potato Wedges, then you’ve heard this before. 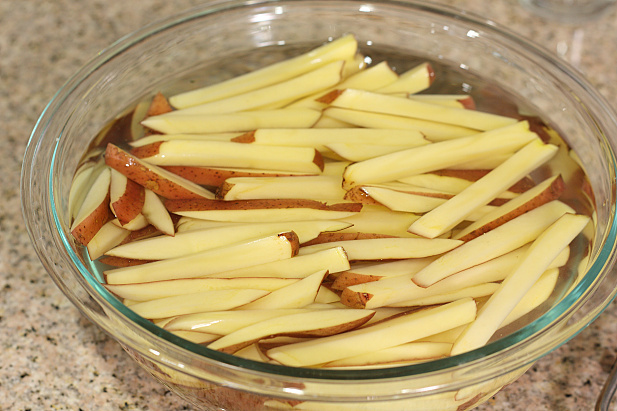 The first trick is soaking the cut potatoes in a water bath for 30 minutes. I know you don’t really want to wait but once you realize you forgot to buy trick #2 (like I did! ), you’ll use up that time to make a quick trip to the store and then also buy way too many mangoes. Oh, that was only me? Alright, then. The second trick is parchment paper. This helps to ensure your potatoes don’t stick and so they brown more evenly. If you haven’t already been using parchment paper, it’s about time you invested in a roll. 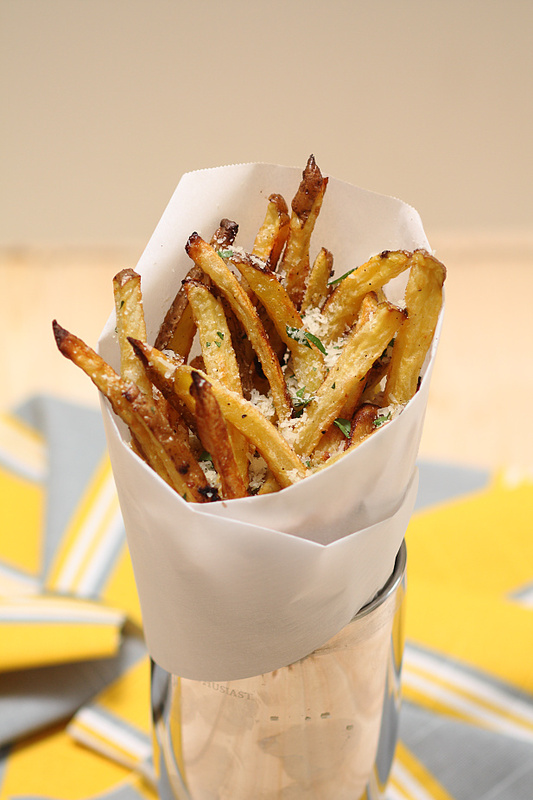 These fries make a fun people-pleasing appetizer. Just roll up a cone of parchment paper, stack them inside and fit inside a large glass. You may have seen these in restaurants as one of their high priced starters. With this recipe you can make them at home for a fraction of the cost AND a fraction of the fat and calories! If you wanna get all French & fancy you can grill up a nice steak and serve them alongside for the classic bistro favorite, Steak Frites. Or, if you wanna be like me, you nosh on them for lunch and then scarf down a stalk of celery just so you can say you ate your vegetables. Can’t wait to hear all your potato desires this week! Slice the potatoes into ¼ inch slices lengthwise. Cut each slice into ¼ inch strips. Place the potatoes in a medium bowl and cover with water. Let sit 30 minutes. Preheat oven to 450 degrees. Drain the potatoes and pat dry. Toss with the olive oil, garlic, salt and pepper. 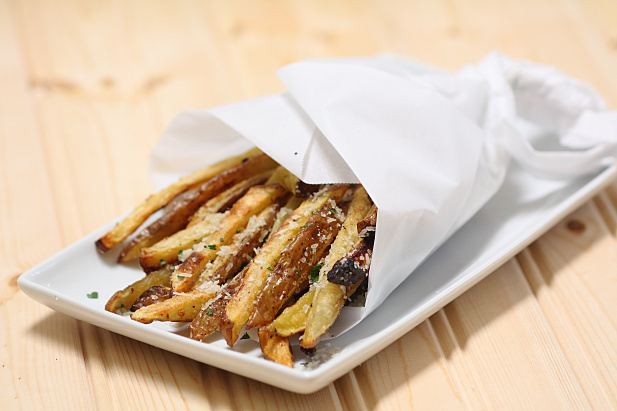 Spread the potatoes in a single layer on 1-2 baking sheets lined with parchment paper. Bake 25-30 minutes, turning the potatoes over every 10 minutes. In the meantime, mix together the parmesan and parsley. 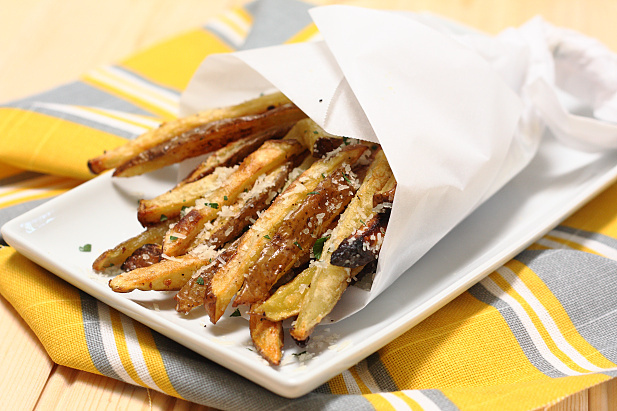 Remove the fries from the oven, plate and sprinkle the parmesan parsley mixture on top. Serve immediately. 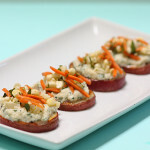 Potato Bites with Ricotta & Corn Relish & a GIVEAWAY! Truffled Potato Smashers and a GIVEAWAY! 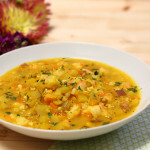 Saffron Potato Soup with Shrimp & a GIVEAWAY!!! These look so yummy! I think I would make oven roasted potatoes with some nice fresh herbs thrown on them! These look fabulous, but what about the garlic part? EEK! Sometimes I make mistakes when transcribe my recipes from scrawled handwriting to typed form and you caught me! 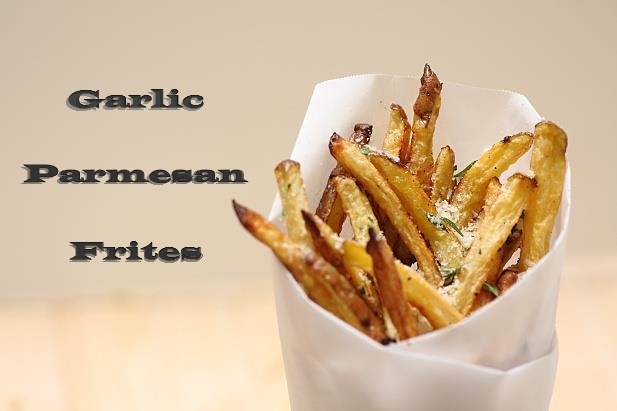 I have fixed the error and now you can be sure to have the garlic goodness in these fries. It is super essential! These look SO good!! I’ve always had issues with oven fries sticking to the pan–I’ve used foil, but I’m definitely going to try the parchment (or Silpat?) trick. Laura, let me know if you try Silpat and how it works. I’ve never used it before. Would love to try a new fry recipe… I’ve been making the same one for four years now, and they’re fabulous, but it’s past time for a change. Or then again it could be this post, the power of suggestion and being 8 1/2 months pregnant talking! I would love to make a scrumptious cheesy potato casserole! I could eat a whole batch of these! Preferably with an array of dippies (aioli, mustard, ketchup, ranch, etc.). I would toss them into a crock pot with some carrots and a pork tenderloin. Rachel, My most recent recipes include the WW Points+. If you look at recipes older than 6 months then they will not have the Points+ but still include the nutrition information. If I had klondike brand potatoes, I would make baked potato nachos! 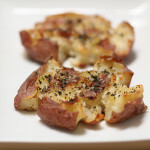 Would love to make twice baked smashed potatoes! And those fries are gorgeous! Is the nutritional information given per serving or for the entire batch of frites? Sara, the nutritional information is given per serving and is calculated using Weight Watchers Recipe Builder for Points+ and MyFitnessPal.com for the calorie counts. Just made these…they’re delicious! I was tempted to sprinkle on some lemon zest but that was an extra step I didn’t feel like taking. However, dipping them in a homemade lemon vinaigrette was so good! Thanks for the delicious recipe! Thanks, Christine! Glad you liked them! 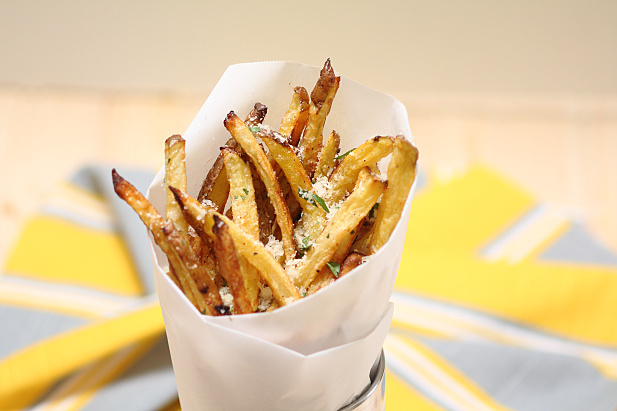 Home » Garlic Parmesan Frites & a GIVEAWAY!